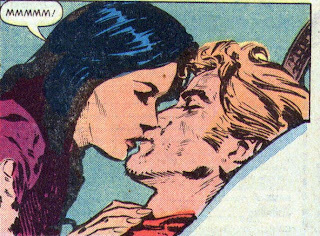 Matching Dragoons: Jonah Hex #46 "Death in the Grass!" 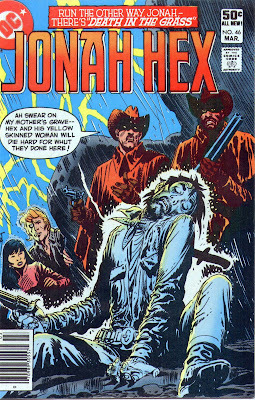 Jonah Hex #46 "Death in the Grass!" Three weeks have passed since Jonah & Ling left the town where they were married and a huge thunderstorm has overtaken them in their search for a home. They stop at a local hotel and when they attempt to check in, the clerk refuses to give them a room, constantly using the word "wife" in quotes. Jonah is about to go ballistic on the clerk when three locals walk in and explain that the hotel is whites only, not for coolies and race-mixers. Jonah is about to increase the population of the local boot hill by three but Ling says that it is not worth it, they will find a room elsewhere. As they continue their trek, the rain stops but the mud ends up overwhelming the wagon when the axle breaks, the horse attempts to bolt and Jonah & Ling are thrown from the overturned wagon. Ling is uninjured but Jonah ends up with a severe back injury and is unable to stand or walk. 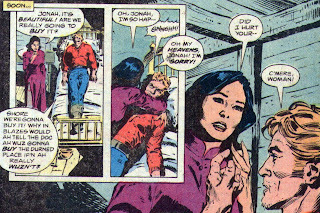 Jonah instructs Mei Ling to saddle up his horse and head for a nearby town to fetch a doctor. It shouldn't take more than two hours round trip. She helps Jonah prop himself against a rock and leaves him with a pair of binoculars, then rides off. As fate would have it, the three bigots from the previous town have decided to follow Hex to teach him a lesson on threatening good decent white folk. They spot Jonah using a telescope but Jonah sees the sun glinting off their lens. Using the binoculars, he realizes the trouble he is in and starts dragging himself into some nearby buffalo grass. By the time the three get to Jonah's location, he is well hidden in the grass so they start searching for him. Bigot #1 finds Jonah but Jonah manages to get off the first shot, that is, he would have if his Colts hadn't jammed because of the mud in them from when Jonah took his fall. Bigot #1 starts gloating, giving Jonah enough time to grab his knife and deliver a message from Mr. Bowie himself. Jonah doesn't have time to retrieve his knife and crawls off further into the grass. Dragging himself onward, Hex encounters a rattlesnake, manages to get his jacket off and around the rattler. Just as he finishes bundling up the viper, Bigot #2 locates Jonah. Hex whispers that if the bigot will let him go, he can have all of Jonah's money in the coat. Bigot #2, also known locally as Stupid #1, unwraps the jacket and gets bit in the throat by the snake and starts screaming. Jonah doesn't have time to grab his rifle and drags himself off into the grass. Bigot #3 shows up and sees that his friend will soon be gone and continues tracking Hex. Jonah has located a small farm, but it is across a large stretch of open land. He decides to start a fire to cover his movement, but his matches are much too wet. Jonah uses his binoculars to start a grass fire and since the grass is wet it's gonna cause a whole lot of smoke. Jonah uses the cover to drag himself to the farm while Bigot #3 has to make tracks to keep from being surrounded by the fire. Meanwhile, Ling has located a doctor and is heading back to save Jonah. Much later the doctor makes this diagnosis "..your fall... produced a traumatizing jolt to your spinal column, resulting in a sort of temporary near-paralysis. The fact that you've continued to experience pain...strongly indicates ...unlikely..serious permanent damage." (I've edited it for brevity) Jonah asks if the doc knows who owns the farm they are at and the doc says that HE owns it and is willing to sell since it is an investment property. Ling is overjoyed that they have found a home and they end on a semi-painful kiss. Jonah's Injuries - Thrown from a wagon resulting in "temporary near-paralysis"
Timeline - Three weeks since last issue. While it was a good adventurous tale, this one really stretched my "willing suspension of disbelief". First off, the wagon wasn't going fast enough to throw Jonah & Ling like it did. I've had back pain and there is no way in hell I would be dragging myself around, climbing a rope or even sitting up. Jonah must be twice as mean as Chuck Norris. Wet grass doesn't catch fire and smoke. Green grass smokes. Wet grass doesn't burn. NEXT ISSUE: Turnbull learns that he wasn't invited to the wedding. Now they've gone and made him mad. Yes, there are a lot of problems with the normal suspension of disbelief, and yet somehow, the guy falling from the loft and being impaled by the pitchfork just MAKES it for me.